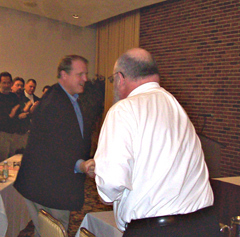 Governor Culver is welcomed by a union member prior to his speech. Governor Culver has signed an executive order which calls for so-called “project-labor agreements” on large-scale state government projects, like construction of a new performance hall in Iowa City to replace the flooded-out Hancher Auditorium. 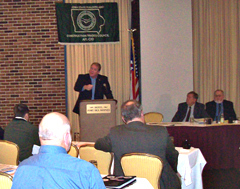 Culver spoke to the Iowa State Building and Construction Trades Council convention this morning about the decision and the governor received a standing ovation from the union workers in the room. William Gerhard of Iowa City, president of the Iowa State Building and Construction Trades Council, says the governor has “listened” to his union. Critics say project-labor agreements raise the costs of state government construction projects because contractors will be forced to pay union wages. A spokesman for former Governor Terry Branstad, a Republican who’s seeking a fifth term as governor, called Culver’s executive order a “back-door way to usurp the legislative process and give payback” to unions because Culver needs the support of organized labor in this election year. Culver rejects the charges. Governor Culver speaks at the Iowa State Building and Construction Trades Council convention. During his speech this morning, Culver made a spirited pitch for other labor-related bills pending at the statehouse, including one which would require the county’s “prevailing wage” be paid to contractors working on any government-financed construction project in the state. Culver said he and others in the the Democratic Party are “interested in fighting” and “making progress” on those issues.